Okay, I still haven't ordered my copy of Kerri Smith's Guerilla Art Kit but I will, I promise! Inspired by Ms. Hula's renegade adventures with her wee ones I have decided to come through with an idea I have been entertaining for almost a decade now. Be a renegade tree decorator and document it! Set out your craft/art supplies and have your wee ones construct a most fabulous tree topper. The more outrageous the better! I did a GIANT star. Cut your shape, paint, decorate as you will and let dry. Once dry, make a loop-dee-loop out of a strip of scrap paper and close using a whole mess of tape ot a stapler. Affix to the back of your topper. You can even have your wee one's jazz up a shoe box to hold your Guerilla decoration kit. Keep it in the car for when a lonely tree calls your name. Keep your kit in a homemade bag and carry it with you on walks. The more your kidlets look for the trees, the more exciting it becomes! Believe me! I've been taking pictures of the trees since 2000 and I get all trigger happy on New Year's Eve. I have never decorated them before and can't wait to start! I'll post pictures as soon as I spot a tree! I had my kit with me yesterday but sadly didn't see nay trees. I promise to post pictures soon and please, please, please if you do this, I would LOVE to see your pictures! **Don't forget to remove your decorations after you take your pictures. Leaving them on would be a lovely and fabulous gesture methinks but it may also be too enticing for some types to steal away and litter the place up with. Keep our streets clean, right? Have a Happy New Year! I wonder how long and far out we will see trees? I once snapped a shot of a tree in June! Don't throw all that gift wrap out! Make a nifty gift wrap collage! Gather up all your gift wrapiness. You know, that pile of torn paper and ribbons and tags. Set out a selection of the goods for your wee ones to art it up with along with scissors and adhesive and something to glue it all onto. Have your wee ones cut or tear pieces of their favorite paper and arrange them onto their work surface for some collage fun. You can use broken-down gift boxes, paper plates, cardboard or heavy paper for your work surface. They can do random placement or make a torn picture. Cut, tear and glue away, add some glitter for fun and you will soon have a nifty memorable holiday collage! Don't forget to recycle the rest! **Collage onto a gift box and refold so that your wee one can have their own nifty treasure box for all those stocking-stuffers. **Cut the scrap gift wrap into strips and make some more paper chains! **Cut long strips of paper and have your wee ones collage onto a paper plate. Don't forget oodles of ribbon and you can make a paper plate hat not unlike the baby shower hats we so love to force new mamas to wear! You may even want to save a box of scraps to keep around for when inspiration strikes. Kidlets can even art up the blank backs of the paper.Have fun! I did this project last week with something else in mind (which I promptly forgot) and then this morning I thought of another way to do it but have no picture of the finished deal. Perhaps you will be inspired and send ME pictures! Set out your supplies in a paint friendly area. Set evrything out on a splat mat or plastic tablecloth. Give each of your wee ones a paper plate and let them squirt 2 to 3 colors of paint onto it. You may want to water the paint down a tiny bit if it is super thick. Add a marble or two and have your kidlet(s) grasp the plate in both hands and wobble it just a smidge to get their marbles to roll around and mix up the paint. Add glitter and/or sequins if you like for some pizazz and sparkle. Set aside to dry. Once dry, help your wee one(s) cut out the center of the plate leaving a paint splattered ring. This will be your wreath. 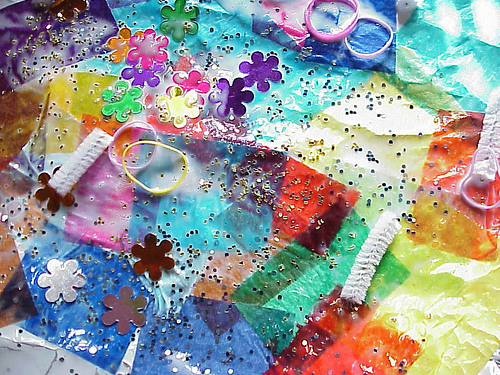 You can set out torn bits of tissue paper, pipe cleaners, cut up straws and more sequins so that they can decorate their wreaths even more. Glue or tape a paper clip to the back near the top and you have an instant hanger. Or, yo ucan use the hole punch to punch a hole for threading some yarn to use as a hanger. Have fun with the colors, do red and green for Christmas or jazz it up in silver and blue for a New Year's wreath. Add a clothespin to the back at the top so that you can clip a holiday card or photograph to hang in the center of the wreath. There are oodles of options, have fun and don't forget to take pictures! Send me your pics and I'll post them here with a link to your blog. When I was 5 years old, I fell ill with pneumonia...twice! Amidst all the colorforms and coloring books, someone had given me a pad of gummed orange paper strips. I remember laying on our old scratchy brown couch wrapped up in a vintage silk quilt making link after link to form this tremendous paper chain. I thought these papers were the bees knees. What better way to make a paper chain than to repurpose your kidlet's own fabulous art? You can even make art for the sole purpose of chaining it up! *glue stick, white glue or tape (kidlets LOVE tape!) scrumdilly-do it! Take scissors to your kidlet's artwork cutting it into thin (no more than an inch and a half wide) strips at least six inches long. Place withing reach of your wee ones. If your kidlets are old enough to do this, allow them to do so. Scissor work is always fun for wee ones and it helps strengthen those wee finger muscles. Decorative edged scissors would work also but sometimes cutting with them can be frustrating. Once all the strips are cut, begin with the first link. Have your kidlet hold their strip in front of them, horizontally and artwork side up. They will need to add adhesive to one end of the strip. Once the glue is on the end, curl the ends under to form a loop, pressing together so that the glue holds. Next, take another strip and insert halfway through the completed loop. Add adhesive to one end and connect, making two complete loops or links, if you will. Continue on until your kidlets have a chain deemed worthy for the tree, their bedroom or wherever it is they wish to display it. You may want to have your wee ones complete a pile of unattached links to alternate with. Sometimes adding a new link to a loop can be frustrating so starting off with a bunch of links to join can ease that frustration. You can also use old holiday cards, gift wrap and/or magazines for this project. Have fun! Many thanks and homemade cookies to blogger bethany actually for repurposing tin foil festive into Holiday Cards! Check out her blog for some fabulous pictures. What a great idea, I wish I had thought of it! Anyone else doing something extra spiffy for the holidays?